Drama is the name of the game when it comes to best friend relationships in girls between ages 10 and 12. Everything is a catastrophe, and usually gets worse before it gets better. What to do? 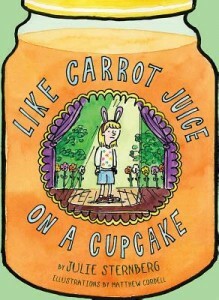 Perhaps offer a children’s book like this one, so that the girls can see themselves with humor and perspective. With the same simplicity, humor, and sensitivity that Sternberg’s other books have, this children’s book takes on the ‘bff’ problem of young girls head-on. There’s no dancing around the hurt feelings, and though they feel like life and death to a 10-year-old, in the end, of course the problems are always resolved. I really appreciate the way that Sternberg’s early reader children’s books are laid out with very short lines. Even if the sentence is two lines long, the line breaks in the middle, making it feel less overwhelming to an early reader. I do have a slight twinge about this particular children’s book, where the writing seems perfect for a beginning third grade reader. The book ends with the issue of a crush on a boy. The paradox in this children’s book is that its language, format, and simplicity are great for third grade, but the content is more aligned with fifth grade issues. So who should read this book? Based on the content, I’d opt for the fifth grade girl. While the book may seem easy to her, it makes a beeline to her emotions, and in that respect, perhaps easy is better.